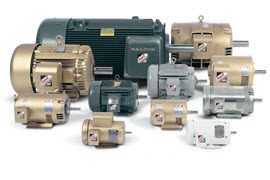 TigerTek is an authorized master stocking distributor for Baldor motors and drives. We provide Baldor sales & service in Greensboro, North Carolina, as well as in Southern Virginia and across the Piedmont Triad region of North Carolina. We are also an authorized warranty repair center for Baldor products, with a team of highly trained and experienced technicians working in our 30,000 sq ft, UL-approved repair facility. As one of the leading Baldor distributors in North Carolina, we've worked with clients of all sizes and across a wide variety of industries. Since 1983, TigerTek has been selling motors and drives in central NC and southern VA.
Our team of Baldor factory trained engineers can come to your plant to review your application, and recommend a motor and drive solution. Baldor's website (www.Baldor.com) offers many features including a product catalog, technical specifications, operator manuals, etc. Delivery is FREE in our fleet area during normal business hours. Emergency/after hours service is always available. Learn why TigerTek is one of the most trusted Baldor dealers serving North Carolina & Virginia - to speak with one of our Baldor specialists, call us now at ,or contact us today to discover the TigerTek difference!